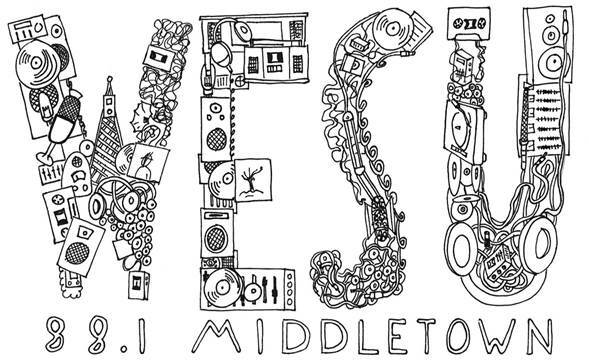 For two hours every Saturday—and any early morning or late night shift available—Middletown resident Franco Liseo fills the airwaves of WESU 88.1 FM, with Italian music. His specialty is the sounds from the ’60s and ’70s; “Love songs,” he says. “When I left Italy, I left with the music”—and he’s been doing this for 30 years. 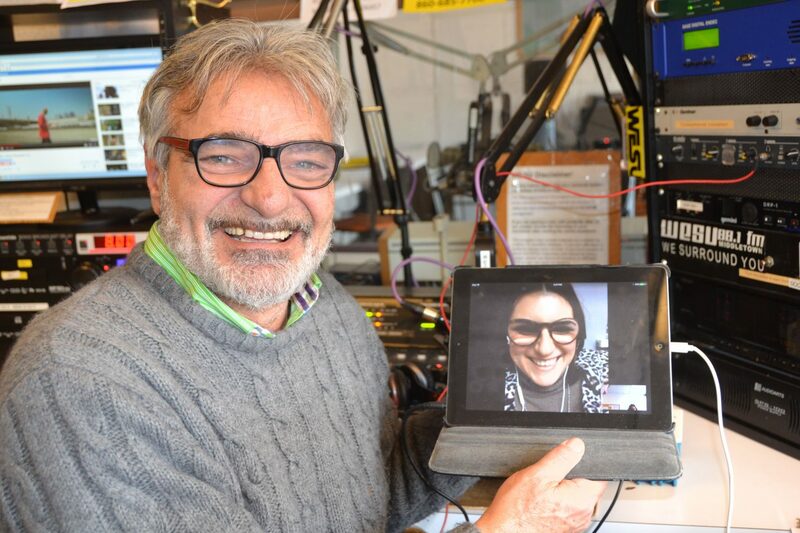 The Saturday show is special; he broadcasts with a co-host, the daughter of a childhood friend, Lucilla Caminito, who Skypes in from Melilli. These shows feature contemporary music that Caminito chooses and sends to Liseo—whose DJ name is “Francaccio”—via the internet, YouTube or on a CD. “She’s prepared for this music; it’s more rap sounds now, the new generation,” he says. 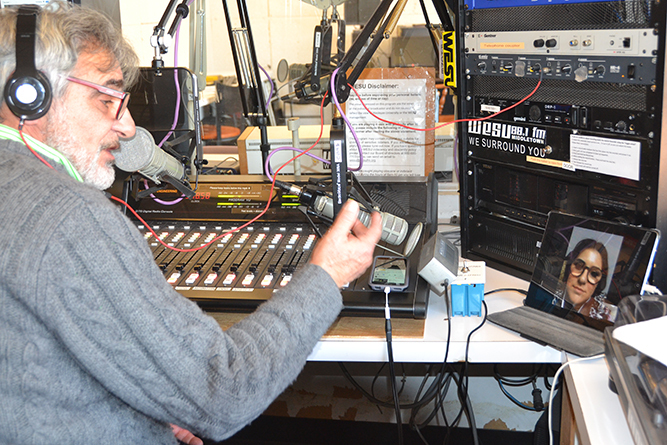 Between songs, the two talk on air in rapid-fire Italian, smiling always and laughing frequently—never with a script—until it’s time for Francaccio to announce, “WESU Middletown,” and push the buttons for another song for their listeners throughout Connecticut and in his native Italy. Then he relaxes, continuing a conversation in Italian with Lucilla and in English with any visitor to the Broad Street location above Red and Black Café. 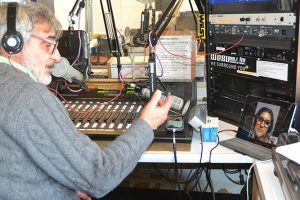 WESU 88.1FM, one of the oldest non-commercial radio stations in the United States, is currently hosting its Annual Fall Pledge Drive through Nov. 24. In addition to Michael, the service WESU provides is made possible by more than 150 student and community volunteer broadcasters and two part-time employees. Donations can be made online or by sending a check to WESU Radio, 45 Broad Street, 2nd Floor, Middletown, CT 06457. Donors will receive a free WESU bumper sticker and limited edition t -shirts and baseball caps. as possible to make our goal a reality,” Michael said. 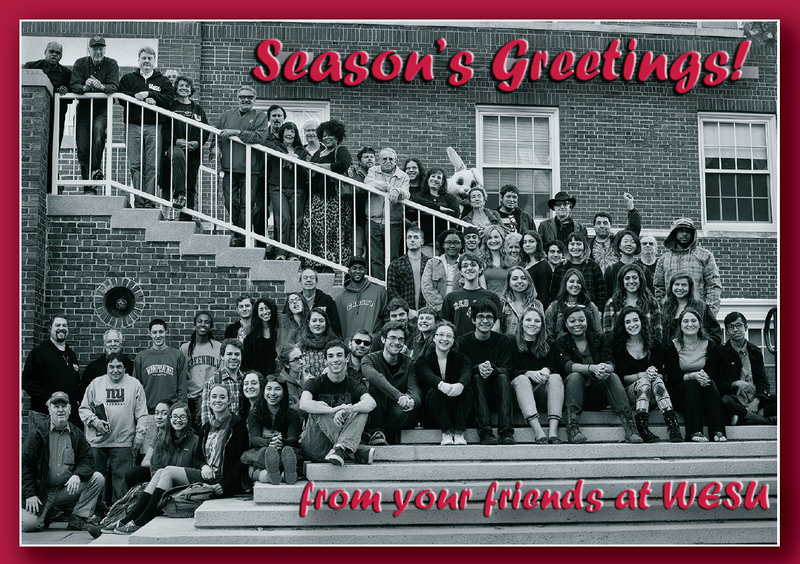 Established in 1939, WESU is funded by the Wesleyan Student Budget committee, Wesleyan University, and generous listener and community support. 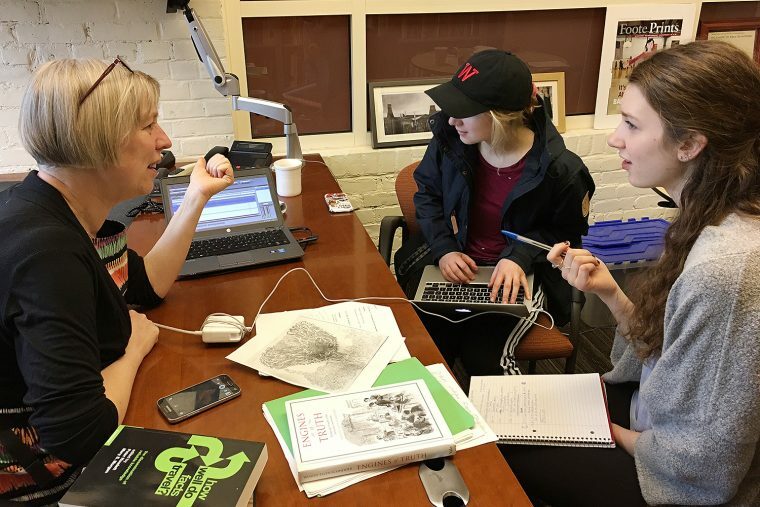 By day, Monday through Friday, WESU offers a diverse mix of news and public affairs from NPR, Pacifica, and independent and local media sources. Weeknights and weekends WESU student and community volunteer broadcasters provide a freeform mix of creative programming featuring everything from rock and hip hop to jazz, electronic dance music, soul, funk, and blues, along with innovative public affairs programming. The station currently broadcasts at the frequency of 88.1 FM from its 6,000 watt transmitter located atop Wesleyan’s Exley Science Center with a potential to reach more than one million listeners throughout Connecticut and Massachusetts. WESU also streams audio online at www.wesufm.org. WESU 88.1 FM recently kicked off its 2016-2017 season with a new and improved fall program. With a mixture of both new and old radio shows, the fall programming boasts a diverse blend of news and public affairs from NPR, Pacifica, and other independent and local media sources. Changes to their fall programming include, the addition of a much anticipated daily public affairs program from Pacifica called “Rising up with Sonali,” which brings progressive news coverage, rooted in gender and racial justice, to a wide audience. They also will pay tribute to Jim Mascia, a cherished, late co-host of “Best of Living Naturally,” a popular, locally produced radio show that promoted a holistic lifestyle, which aired for 10 years on WESU. 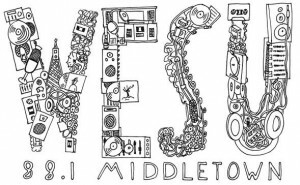 “Overall, the aim of WESU’s fall program is to maintain the eclectic, alternative, and funky mix of music and talk radio that makes WESU so unique,” said Ben Michael, WESU general manager. Established in 1939 as a community service of Wesleyan, WESU is one of the oldest, non-commercial radio stations in the U.S. While its daytime programming consists of news and public affairs, weeknights and weekends offer a freeform blend of creative music programming, featuring everything from rock and hip-hop, to jazz and electronic dance music. To learn more about WESU, including listen to a live stream, find contact information, see DJ playlists and the program guide, visit www.wesufm.org. 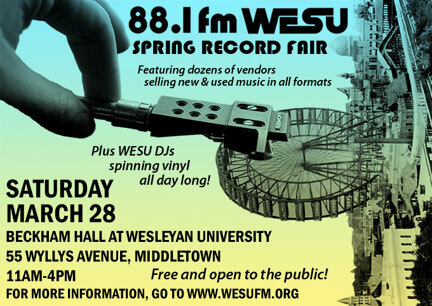 WESU, Wesleyan’s radio station, is hosting its annual Spring Record Fair in Beckham Hall on April 10. From 11 a.m. to 4 p.m., vendors from across the greater Connecticut area will be selling rare records and CDs. Those in attendance will have the opportunity to not only browse through hundreds of records, CDs, posters, and T-shirts, but also enjoy WESU DJs spinning vinyl live. WESU is one of the oldest non­commercial radio stations in the United States. It offers a diverse mix of news and public affairs from NPR, Pacifica, and independent and local media sources on weekdays; weeknights and weekends are dedicated to Wesleyan students and community volunteer broadcasters, who provide a freeform mix of creative music programming featuring music not readily available elsewhere on the radio. Tune in to 88.1 FM or online at www.wesufm.org. 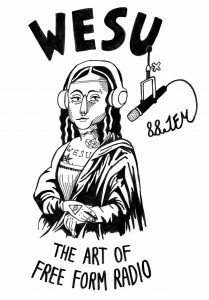 WESU 88.1 FM is celebrating its 77th season providing alternative radio to the greater Connecticut area. WESU, one of the oldest college radio stations in the country, kicked off its new spring season this week with new and old shows, hosted and produced by more than 100 dedicated community members and Wesleyan students. every from 9:30 to 11 p.m. every first, third and fifth Wednesday of the month. WESU also offers talk and public affair shows including “All About” with Isabel and Emily, which features a new guest every week. WESU’s “For Women Over 40” with Cyma Shapiro, a contemporary lifestyle talk show, has recently been picked up for syndication across the country by Pacifica. http://wesufm.org/. Like WESU on Facebook and follow it on Twitter @WESUtunein. View the entire WESU spring schedule online. 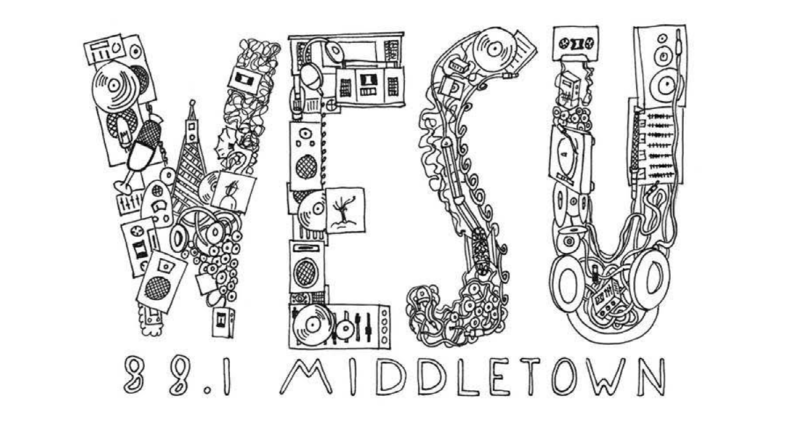 Established in 1939 in Middletown, WESU is one of the oldest noncommercial radio stations in the United States. 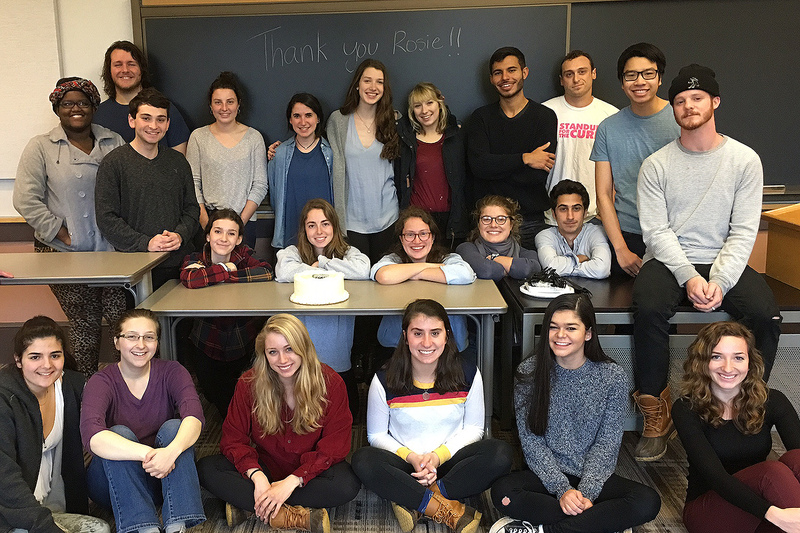 WESU is funded by the Wesleyan Student Budget committee, Wesleyan University, and generous listener and community support. By day, Monday through Friday, WESU offers a diverse mix of news and public affairs from NPR, Pacifica, and independent and local media sources. Week nights and weekends WESU student and community volunteer broadcasters provide a freeform mix of creative programming featuring everything from rock and hip hop to jazz, electronic dance music, soul, funk and blues, along with innovative public affairs programming. located atop the Exley Science Center with a potential to reach more than one million listeners throughout Connecticut and Massachusetts. With $7,000 additional dollars still needed to reach its goal, WESU 88.1 FM is continuing its annual Fall Pledge Drive. Listener contributions will allow the station to continue to offer its unique blend of programming, including The Moondog Matinee, playing “oldies” every Saturday morning for nearly 40 years, as well as to support locally produced public affairs shows like Think Twice Radio, a Connecticut “watchdog” media show, and new music shows like Black Music Matters. 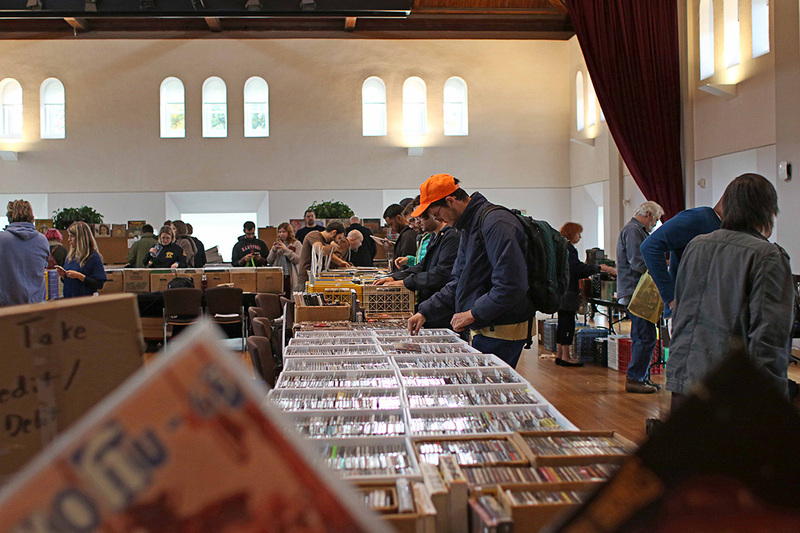 WESU 88.1 FM hosted its annual Fall Community Record Fair Oct. 18 in Beckham Hall. Dozens of vendors from across the Northeast sold vinyl, CDs, posters, t-shirts and other items. WESU 88.1 FM is holding its annual Spring Pledge Drive to support another season of community-driven radio. The station aims to raise $20,000 this spring to close out a capital campaign that started at the beginning of 2014, when the station kicked off its 75th anniversary year. Meeting its pledge goal this spring will allow WESU to complete some much-needed studio updates, including an audio mixing console in the air studio, as well as other technical improvements that will strengthen infrastructure and better accommodate live in-studio performances. These upgrades will also enable WESU to broadcast from remote locations. 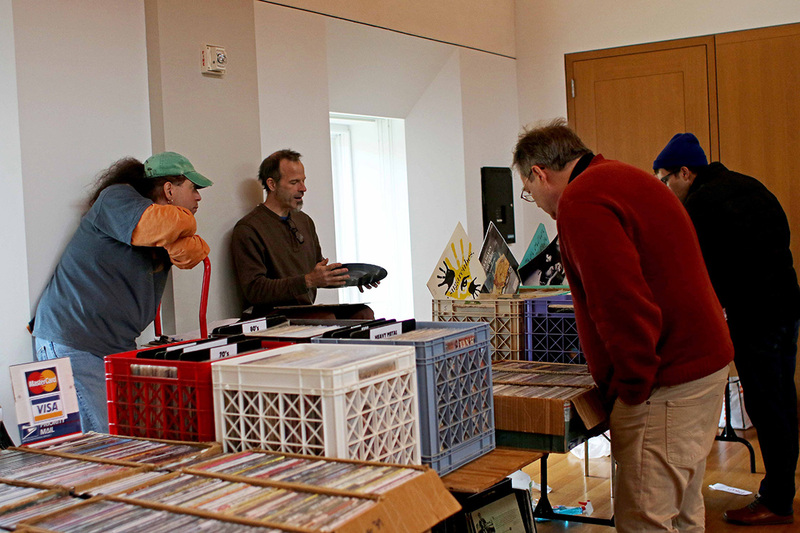 With more than 20 vendors from throughout New England and the tri-state area selling new and used music in all formats, the 88.1 FM WESU community record fair has become a cherished tradition, attracting a diverse crowd of new and old record collectors. The WESU Spring 2015 Record Fair will take place from 11 a.m. to 4 p.m. March 28 in Beckham Hall. Browse new and used CDs, records, music-related apparel, books, WESU merchandise and more. WESU DJs will be spinning records live throughout the day to inspire your crate digging. WESU also is accepting donations for the fundraising event. Now more than 75 years old, WESU is one of the oldest non-commercial radio stations in the United States. By day, Monday through Friday, WESU offers a diverse mix of news and public affairs from NPR, Pacifica, and independent and local media sources. Weeknights and weekends, WESU student and community volunteer broadcasters provide a freeform mix of creative music programming featuring music not readily available elsewhere on the radio. The station currently broadcasts at the frequency of 88.1 FM from its 6,000-watt transmitter located atop the Exley Science Center with the potential to reach over 1 million listeners throughout Connecticut and Massachusetts. WESU also streams audio online through their website www.wesufm.org. 88.1 FM WESU community radio is currently hosting their annual holiday pledge drive. The 2014 drive will help fund studio upgrades and support the station, run by 150 student and community volunteers. Wesleyan’s non-commercial college and community radio station, 88.1FM WESU, is holding its 10th annual WESU Holiday Pledge Drive. 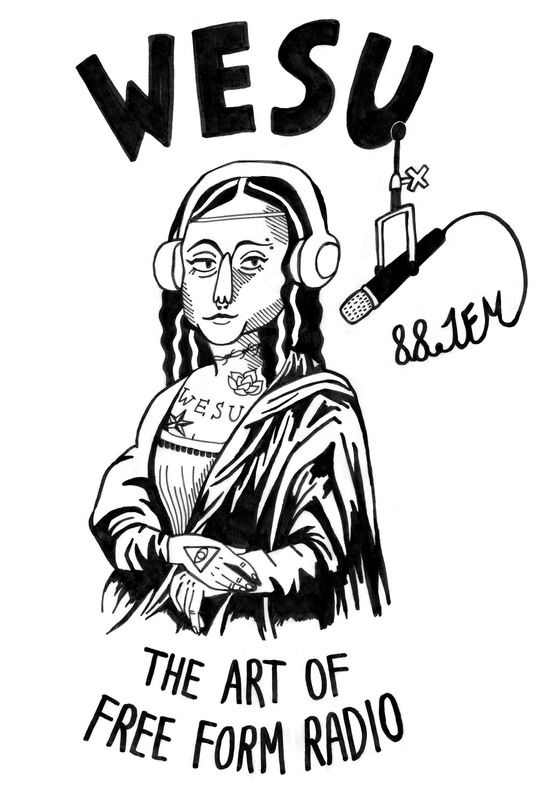 WESU is a constant source of diverse music, provocative public affairs, and creative free-form programming that has engaged countless curious and discerning listeners for more than seven decades. The station is currently celebrating its 75th year of operation. Community support during this pledge drive supports locally produced free-form radio created by student and community volunteers. Currently, WESU operates 24 hours per day, seven days per week, and is supported by a volunteer staff of over 150 student and community volunteers, one part-time paid staffer, and one full-time general manager. The 2014 drive will specifically target much-needed studio upgrades. WESU offers a unique mix of public affairs and cultural programming that reflects the diversity of the communities that it serves. 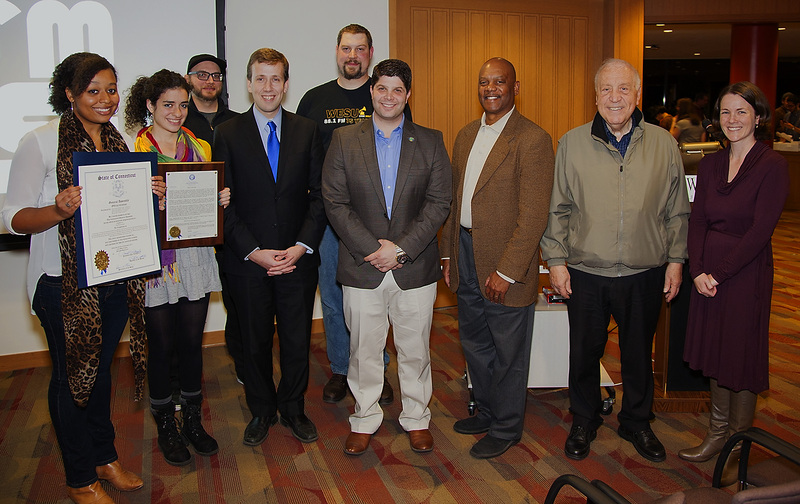 On Nov. 2, elected city and state officials and university staff joined a large crowd of WESU volunteers and staff in Wesleyan’s Daniel Family Commons for an event commemorating the community radio station’s landmark 75th anniversary.State Representatives Matt Lesser and Joe Serra presented the WESU Board of Directors with a citation, and Middletown Mayor Daniel Drew was joined by Councilmen Grady Faulkner and David Bauer to present the station with a Proclamation from the City of Middletown. Cathy Lechowicz, director of the Center for Community Partnerships, and Ben Michael, WESU general manager, gave brief remarks about the important role WESU has played in fostering university and community engagement.